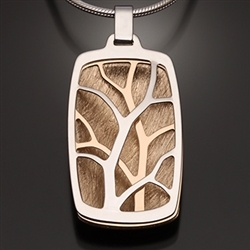 This nature inspired pendant consists of a layer of sterling silver on the front and a sheet of 14K bi-metal in the middle and on the back. There are multiple color options to choose from for the niobium back sheet as well;these are listed as a separate item. These colors are interchangeable; so you can order more than one back and easily switch them out as desired. The three layers are collectively suspended, allowing some movement within the piece. The front and back sheets are curved outward, creating depth between the layers. This pendant is 3/4” x 1 1/4” and comes on a 1.5 mm sterling chain.